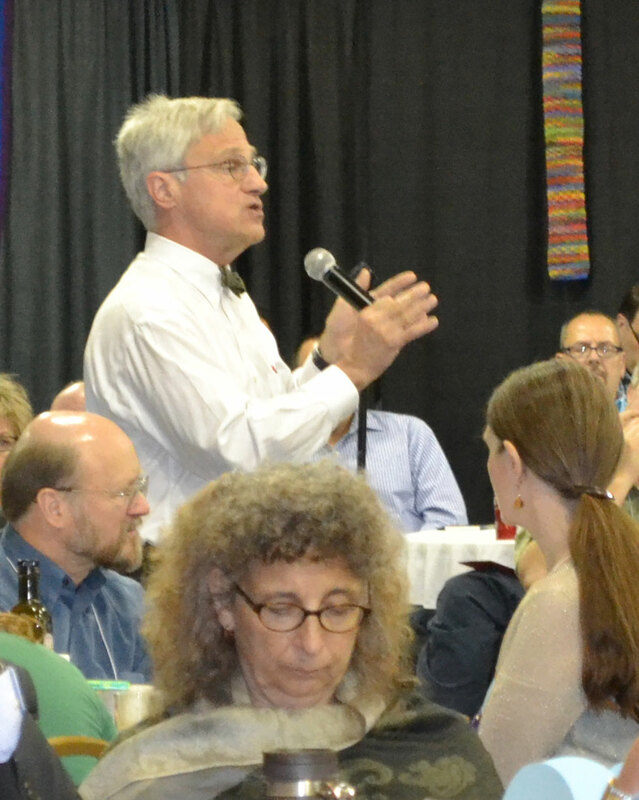 Delegates to the 214th Annual of the Massachusetts Conference this weekend overwhelmingly affirmed a Resolution urging divestment from fossil fuel companies - a resolution the Board of Directors had earlier voted to send to the UCC General Synod, the denomination's biennial meeting. Confence Minister and President Jim Antal responds to a delegate's question on divestment. Some delegates attending a hearing on the resolution Saturday morning questioned whether it would be effective, and whether there might not be more productive ways to combat climate change, such as investing in alternative energy sources. Kemper acknowledged that if all religious groups and colleges and universities – where the divestment movement began – divested, only 2 percent of fossil fuel stock would be impacted. When the resolution came before the full meeting Saturday afternoon, one delegate asked what effect such divestment would have on the UCC’s portfolio, and what plans were in place to replace those funds so that the portfolio would not be put at risk. Conference Minister and President Jim Antal acknowledged the importance of that question to all who hold UCC Pensions or whose churches have endowments with United Church Funds. He said the UCC Pension Boards have been unable to fairly analyze the impact given that there are three schools of thought on the questions. Susie Phoenix, a delegate from the South Action Congregational Church, said delegates should vote for the resolution, no matter what the impact would be on the UCC’s portfolio. “Sometimes you do take a hit when you decide to divest from unethical businesses, and I’m proud to do that, if that be the case,” she said. Another delegate asked if that, by divesting, the UCC gives up the ability to engage in shareholder activism. Antal responded that the resolution lays out a five year time frame for divestment, thereby allowing for activism in the near term. Since the Conference Board of Directors first voted in December in favor of bringing the resolution to Synod, 10 additional Conference Boards and numerous local churches have voted to co-sponsor or endorse the resolution. Because the resolution had already been submitted, Annual Meeting delegates could not offer amendments to it. The full text of the resolution, and it's endorsers, is at: macucc.org/divest. “Sometimes you do take a hit when you decide to divest from unethical businesses, and I’m proud to do that, if that be the case,” said Susie Phoenix, a delegate from the South Action Congregational Church.